In the art exhibition Skyway Selections the Waubonsee Community College’s Art Department presents artworks in media such as painting, drawing, photography, and design works by some of our outstanding art students. Skyway Selections is a group show of 30 student artworks selected by Guest Juror, Michael Barnes, Professor of Printmaking in the School of Art and Design at Northern Illinois University. 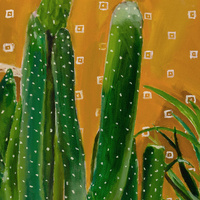 Image: Cacti by Valeria Torres, 2018, Oil paint on canvas, 24 x 18 in.